Of all the pan mees I’ve tried so far, this is probably the best pan mee I’ve ever eaten. This dish has been in my favourite food list since decades ago because I’ve been (and still) eating it when I was at a very young age. It is probably different from the other pan mees because of the way they cook the minced pork. Most of the hawkers serve their pan mee with minced pork, which was cooked with thick dark soy sauce. This is not the case for this stall as they cook the minced garlic-pork together with the noodles. With the anchovies-based soup (Malay : Ikan bilis), the minced pork somehow makes the soup richer and sweeter too (not MSG-sweet nor sugar-sweet). Furthermore, having the meat served in different way, I love the noodles which is made on daily basis (probably hourly basis). It has this silky smooth texture with bouncy feel. It is not too soft nor too hard as it is cooked to perfection, as one said. 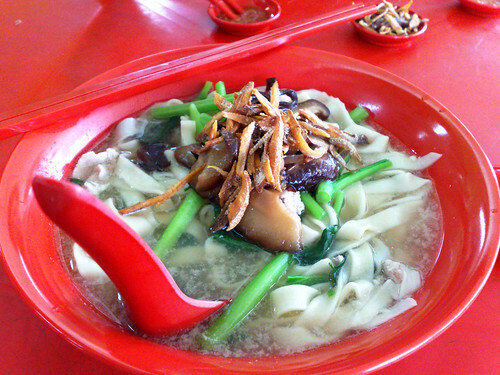 It cost RM4.00 per bowl and with addition of RM0.50, you get to add extra noodles. By special request, you could ask for ‘Choy Sam’ too. So, get yours at below location. 1) You have to go early (before 12pm ) or later (after 1.30pm) to avoid crowd because it is quite packed during peak hours. Besides, the shop is rather dirty yet stuffy and hot. So, you have high chances of drenched in sweat (like me) during hot weather. 2) Besides Pan Mee, there are other good food too such as Pork Noodles, Chicken Rice, Yong Tau Foo and Penang Fried Kuey Teow. Not to worry about the quality as they are pretty tasty.